And, I'm back! I can't believe it has been so long since I grocery shopped. When we went to Publix on Monday it was the first time I had been there for more than one item since mid-December. Our pantry and fridge were looking pretty pathetic. I know it may be hard to believe but we actually only ran out of almond milk, yogurt and eggs last weekend. Between eating with family for the holidays and going out of town three times (one of which was for five days), we really did have everything we needed on hand. It was really nice to take a break for shopping lists and coupons. We could have stretched it out longer if we wanted to but I was ready to have some of my favorite snacks and treats on hand again. This week's trip was amazing except for the fact that our store was out of almond milk (how is that possible?) and Justin ended up having to run back and grab some the next day. It was nice to stock back up on dairy, eggs, and snack items for our lunches. We also got our biweekly produce share this week and it was filled with things we use on a regular basis so that has been really nice for meal planning. We are going to attempt to organize our pantry and freezer in the next few weeks so I can get a better grasp on what we need to be shopping for and stocking back up on in 2014. I am also trying to decide if we need to place a Zaycon order for February. We definately haven't eaten our way through our Fall order but it appears that they won't be doing Summer orders this year and I am worried we won't make it until the Fall sale. This week I used Checkout 51 for the first time. 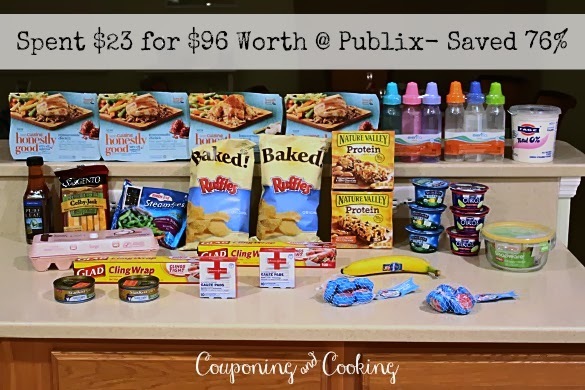 It is a cash back app like ibotta but it seems to match up perfectly with the Publix weekly sales. I earned $1 for Fage yogurt plus an extra $2 for uploading my first receipt over $20 total. They send you a check once you reach $20 in cash back and it seems relatively simple. I combined mine with coupons and if there were ever duplicate offers I don't see why you couldn't use it with ibotta cash back too. Personally, I am happy to earn cash back on things I am already buying especially when it's so easy.